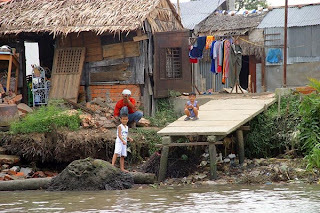 A trip through the delta will open up your eyes, and is a highly recommended side trip from Ho Chi Minh. In fact, my suggestion is to go for at least a 2-day trip. This is because one of the highlights of the trip is to see and experience the early morning floating markets. For the single day-trip, you will miss this highlight. 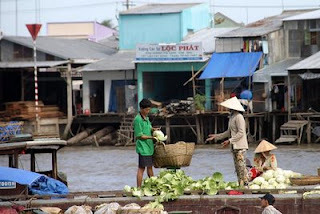 The Mekong Delta marketeers do their transactions on "floating markets". Their merchandise are brought along in their boats, and they scour around a large area, or hang around an area. Residents on the banks of the Mekong who need to buy something will just take their small boats to these areas - essentially "going to market". Those living in the boats just bring their "home" to market!! Among the things you'll see along the delta and its tributeries, are "factories" which produces various kinds of snacks that are rice-based. One of them, known as poprice, is certainly interesting to see them made. 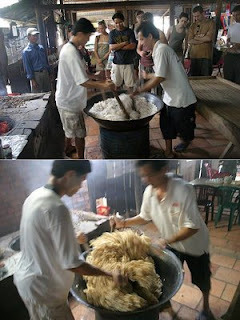 They take rice grains, after being de-husked, and throw them into hot sand where they will be "popped" (like pop corn). Then they are mixed with a concoction of maple syrup, coconut milk etc. Then they are put into a mold, and cut into blocks of sweet nice snacks! Yummy! The people of the Mekong Delta are among the friendliest in Vietnam, especially if compared to city folks in Ho Chi Minh. 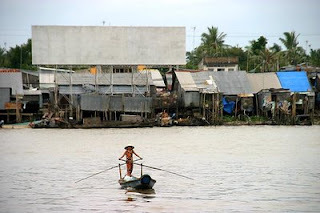 I really enjoyed the Mekong Delta. t, will take up your recommendation to have a look-see at the Delta the next I vist HCM. Will be visiting HCM at least 3 times this half of the year. add up to a month+. Will be checking out the delta. You had to tweak your pictures a little on photoshop for the HCM one did you? imagining the mess and dull colours there. is it wrong for me to think that way? Sorry for the terribly late reply, somehow missed the post.